An Act to provide for the grant of weekly holidays to persons employed in shops, restaurants and theatres. (3) It shall come into force in a [State] or in a specified area within a [State] only if the [State] Government by notification in the Official Gazette so directs. (f) “week” means a period of seven days beginning at midnight on Saturday. (2) The day so specified shall not be altered by the shopkeeper more often than once in three months. 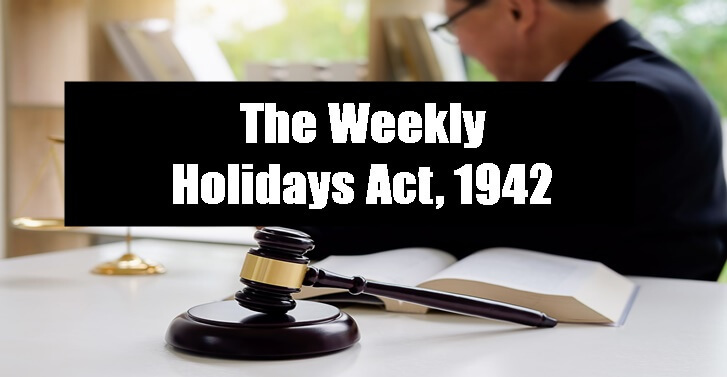 Provided that nothing in this section shall apply to any person whose total period of employment in the week including any days spent on authorised leave is less than six days or entitle to an additional holiday a person employed in a shop who has been allowed a whole holiday on the day on which the shop has remained closed in pursuance of section 3. 5.Additinal half-day closing or holiday State] Government may, by notification in the Official Gazette, require in respect of shops or any specified class of shops that they shall be closed at such hour in the afternoon of one week-day in every week in addition to the day provided for by section 3 as may be fixed by the [State] Government, and in respect of theatres and restaurants or any specified class of either or both, that every person employed therein otherwise than in a confidential capacity or in a position of management shall be allowed in each week an additional holiday of one-half day commencing at such hour in the afternoon as may be fixed by the [State] Government. (2)The [State] Government may, for the purposes of this section, fix different hours for different shops or different classes of shops or for different areas or for different times of the year. (3) The weekly day on which a shop is closed in pursuance of a requirement under sub-section (1) shall be specified by the shop-keeper in a notice permanently exhibited in a conspicuous place in the shop and shall not be altered by the shop-keeper more than once in three months. 7. Inspectors Government may, by notification in the Official Gazette, appoint persons to be inspectors for the purposes of this Act within such local limits as it may assign to each such person. (2)Every inspector appointed under this section shall be deemed to be a public servant within the meaning of section 21 of the Indian Penal Code (45 of 1860). (c)exercise such other powers as may be necessary for carrying out the purposes of this Act. (2) Any person having the custody of any record, register or notice maintained in pursuance of rules made under clause (c) of sub-section (2) of section 10 shall be bound to produce it when so required by the inspector, but no person shall be compellable to answer any question if the answer may tend directly or indirectly to criminate himself. 10. Rules Government may, subject to the condition of previous publication by notification in the Official Gazette, make rules for carrying out the purposes of this Act. (c) require registers and records to be maintained and notices to be displayed in establishments to which this Act applies and prescribe the form and contents thereof. 11.Government in respect of all other establishments within the [State] may subject to such conditions, if any, as it thinks fit to impose, exempt any establishment to which this Act applies from all or any specified provisions of this Act, and may, on any special occasion in connection with a fair or festival or a succession of public holidays, suspend for a specified period the operation of this Act. For more details refer to lawyers in India.